Joe Guglielmetti journeyed to Fiji during the fall of 2017 and paddled around the island of Kadavu. This report on his trip is part of a longer writing project that is currently completing. Joe is a sea kayak guide for Portland Paddle. The ferry leaves at midnight from Suva. I stand astern, second deck, among some Fijian men. I am the only tourist on this boat. The twin engines pump smoke up stacks that terminate below the railing. We cross the lively sea for several hours. I sleep upright for perhaps an hour in a plastic chair as the wafting cigarette and diesel smoke slide into my nose and mouth. The first hint of light arrives as we sail east of North Astrolabe Reef, the almond shaped coral ring at the northern terminus of the Kadavu Island Group. Dawn rises, and we see the striped colonial tower of Solo Lighthouse on a volcanic outcropping. To reach Matava, which is my port of call, we must leave the protection of the Great Astrolabe, sail parallel to it, and then swing back in through a narrow channel. Long swell rolls in, and wind waves topple it. The sea is big and blue. As the swell collapses onto the Astrolabe, it sounds like a jet engine during takeoff, constant and deep. 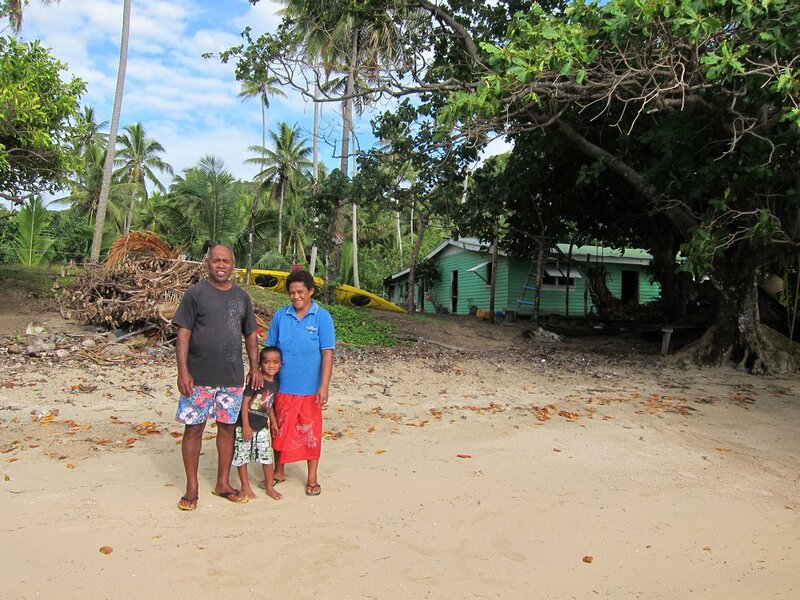 Ratu, his wife Aliti, and their four children live among the wind bent palms on a peninsula called Natubagunu. Ratu is a district chief, and is well known across the whole island. 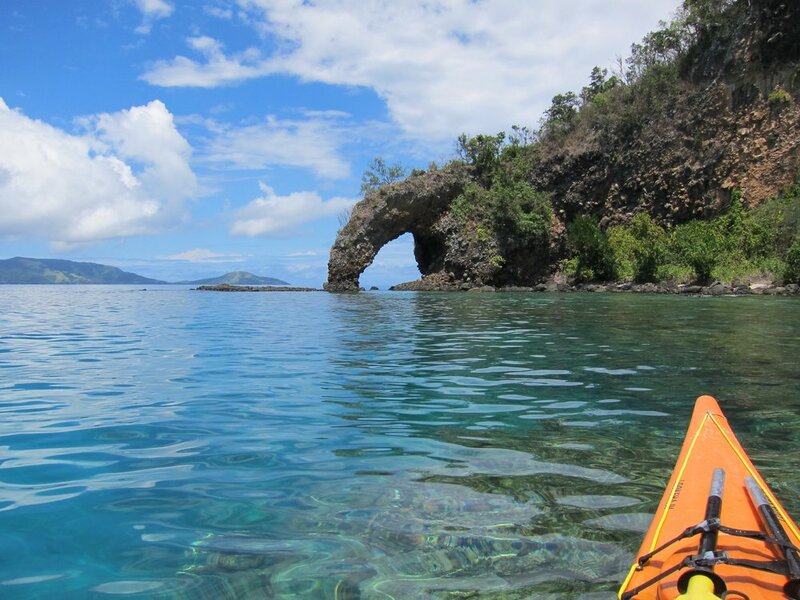 He is a kayak guide by trade, often leading groups of tourists around the northern sections of the island. Behind his house, a sturdy rack made of round wood supports many Necky Amaruks, and a few Looksha IV’s. I stay at this warm homestead for three nights, and Ratu teaches me about the island in preparation for my circumnavigation. We eat crab, cassava, and rice. We drink a lot of tea. The trade winds blow from the southeast, pushing the ceaseless roar of the Astrolabe through the yard and open house. I introduce Tony, the youngest, to Skippy peanut butter. He likes it so much his nickname is now Skippy. The family has a guest room that they prepared for me, and I sleep well each night, tucked beneath the mosquito net, wondering what the journey will bring. The day before my circumnavigation is to begin, I slowly load my rental kayak, which is an old orange Looksha IV. 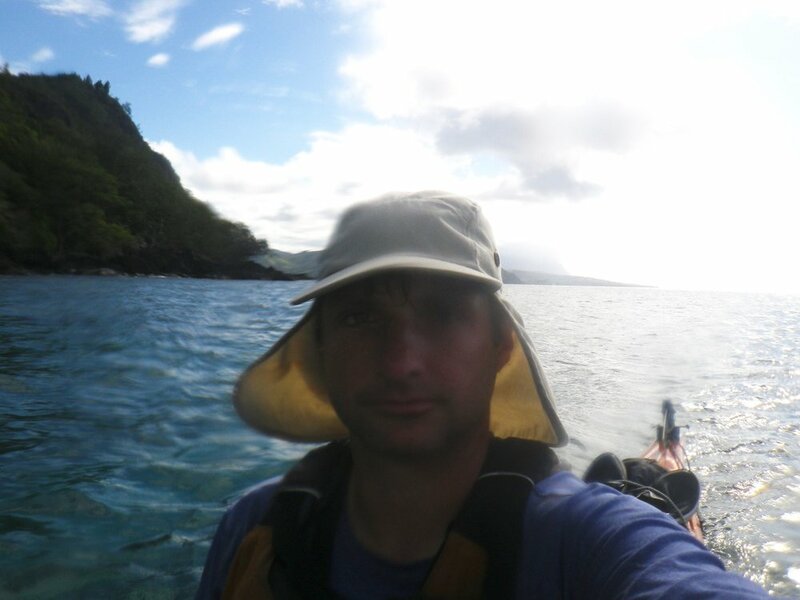 Once ready, I embark on a test paddle toward the local school, two and a half miles northwest, following the volcanic rocks of the shoreline. My packing is not ideal. The weight is not balanced correctly, and downwind runs feel squirrely. I strap the kava root to the deck intending to later pack it properly. 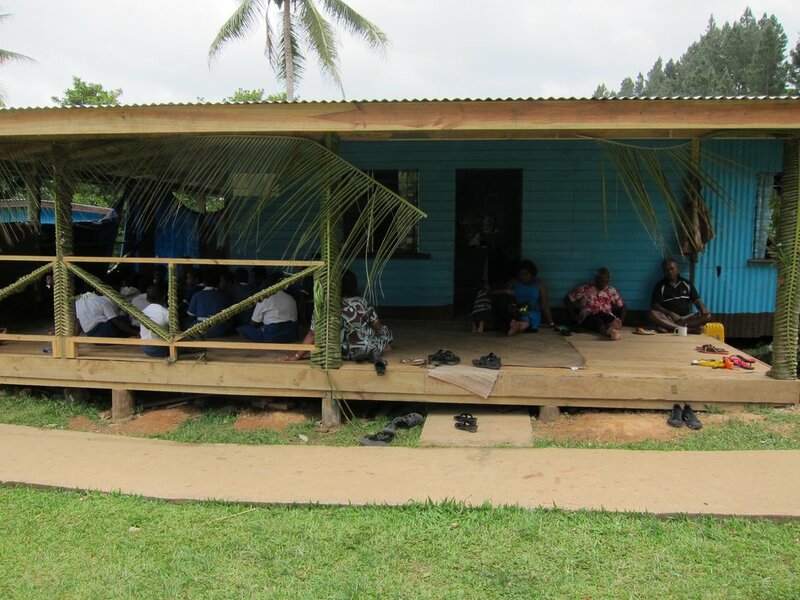 At school, the children take standardized tests that will determine their secondary school placement. I follow the shoreline into Soso Bay, as opposed to tracing the inner edge of the Astrolabe, because a northeast wind blows, and I paddle alone and cannot risk being blown into the tremendous break on the reef. A dorsal fin passes about ten meters ahead of me, and my reaction is to paddle toward it out of curiosity, which is not how I imagined I would react during shark encounters. It disappears smoothly under the electric blue water. 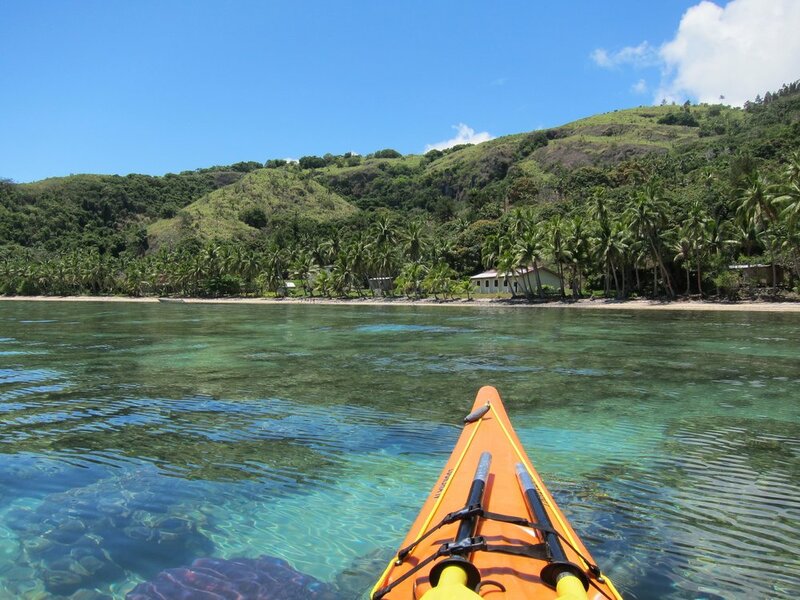 I paddle across the upper bay, between Kadavu and some smaller islands, farther from the reef now, but I see and hear it to the south. From this distance the thick mist rising from the breakers, along with the constant roar, makes the reef akin to the top edge of a long waterfall. I attempt to stop for lunch in a mangrove covered pile of rocks. Crabs scatter as I run the boat into the stones. The tide is high, and I am only able to scoot out and swing my legs into the cockpit, boat still afloat. I eat two protein bars and toss the rappers into the cockpit. 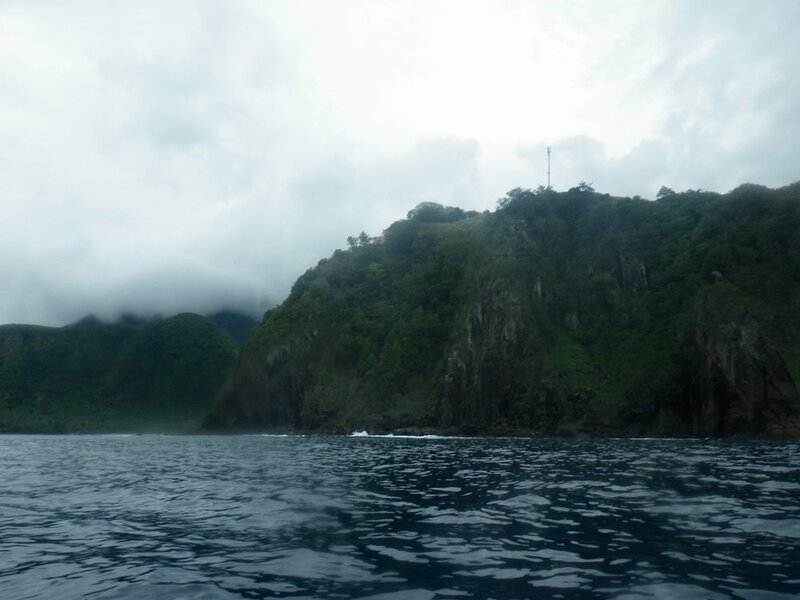 I run downwind after launching, between volcanic knobs, lush with flora. 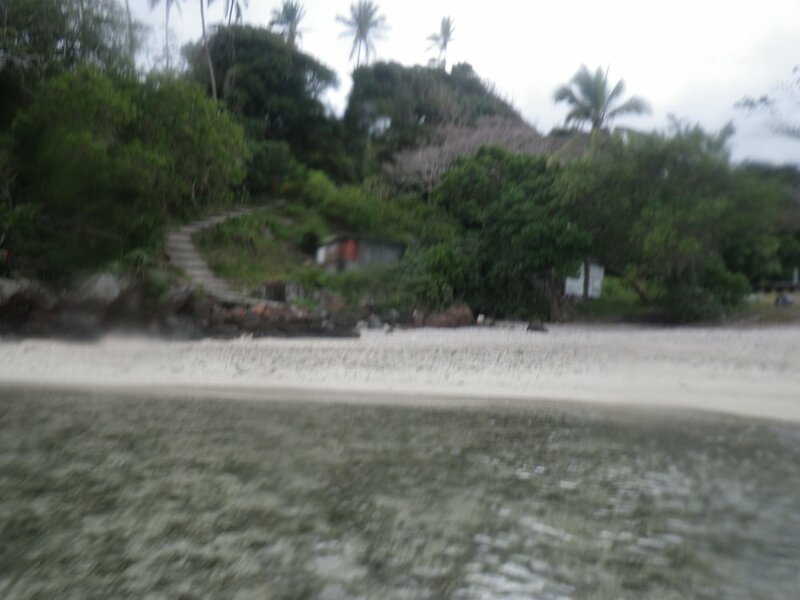 I land at Galoa Island, and greet some young men by the shore. They take a break from shoveling beach sand into buckets. I ask to see Brenton, the man whom Ratu told me to find. Their faces wince in confusion, but they lead me up a hill. I stay with Brenton and his wife Braun for three days, in order to time my rounding of the exposed Southwest end of the island with lower swell. While staying on Galoa, I work on the farm for four hours a day in exchange for a bed and food. I mostly help a man named Xavier build a house. 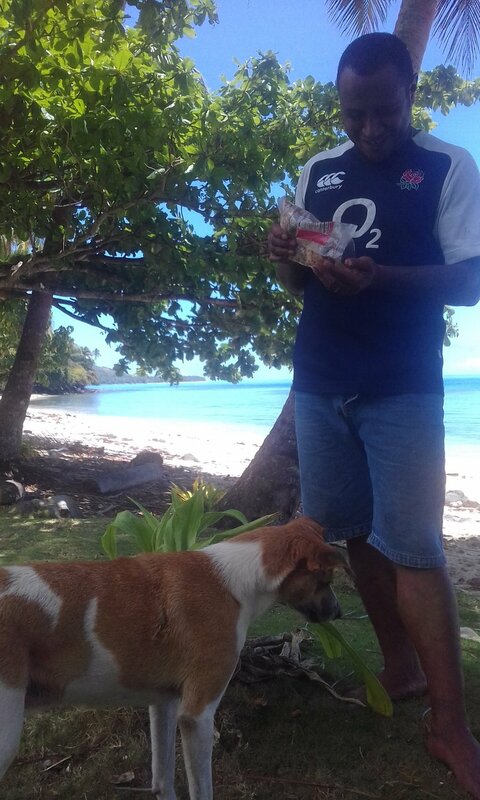 He was displaced from Koro Island, to the north, during Cyclone Winston, and Brenton invited him to live on his land. My last night, Brenton and Humphrey, his neighbor, introduce me to ritual kava drinking. The kava is cool and thick, and the conversation is deep. The Astrolabe swings in and hugs the shoreline along the claw shaped peninsula leading to Muani. I begin to paddle onto the reef when the tide is just high enough to get purchase with the paddle blade, although I still feel it scratch against the sharp coral below. The swell crashes to my left, and tidal current begins to flow through the reef, opposing my boat. Long remote sand beaches stretch out to my right; no villages occupy the peninsula until Muani. Every half mile or so, I pass a shack set back into the jungle a bit, and I assume these encapsulate people who have either voluntarily left society, or were pushed out. I have no desire to stop and find out either way. As the tide rises, some energy from the swells flows through and creates more liquid texture over the reef. Through the narrowest section, I feel mist from the breakers. Although the primary swell has a very long wave period, the break roars like a jet, constant waves pounding, implying that other swell comes from other angles, and that the idiosyncrasies of the reef’s edges refract and confuse the sea’s rhythm. The section from Muani to the Isthmus extending south of Nasau is protected again, and I have a tailwind. But I don’t feel relaxed, as I know I have to leave the reef in a few miles. My mind runs through all of the ways my attempt at circumnavigating could be thwarted in open water, with such a swell running, and precarious humid weather. In this moment I feel that being a guide and instructor stresses me. A pure adventurer would, perhaps, have a shorter litany of reasons not to take this particular route, alone, in a remote place. I stop for lunch on an inviting beach. I once again only eat protein bars, shoveling two into my mouth rapidly, rappers again landing in the cockpit. I smell smoke, and look into the bush and see that someone recently built a fire in a small ring. I then hear cracking twigs, and a very old man, barely capable of walking, takes slow long steps through the brush, like a dinosaur trapped in a little old man body. I feel nervous, and decide to launch before really resting. As I push the Looksha through the crushed shell sand and into the sea, the man finally notices me and looks perplexed. After beginning to paddle away, I feel remiss for not talking with him. I realize that my general anxiety about being alone in a strange place has overtaken my normal affability. The reef swings south and ends far out from the land, and I follow the land. As I round the upcoming cove’s edge, the swell now finds its way to shore, and I must choose lines inside, and outside of the breakers that rear up. I can see a village at the center of the cove, which must be Daviquele. I land near the school, and two men come to greet me. I share peanuts with them, and we talk about Kadavu, America, and one of the men’s new fishing boat. I and ask about Thikombia Point, which is the big volcanic outcropping I must round to get to the end of the island. It extends out into the sea at the west side of the cove, and they assure me that today, I can make it around. Paddling around Thikombia, I feel more exposed to the whims of nature than ever before in my life. I am alone, out beyond the reef, one hundred yards from huge volcanic cliffs, and warrior like swell cruises in, all of the way from its birth in the Tasman Sea, fifteen hundred miles away. There is nothing between Antarctica and here, not even a continental shelf. Kadavu lifts suddenly out of the South Pacific, arresting the powerful rhythms of the sea. The ocean now looks purple, and the sky is grey. The swell thunders against the base of the cliffs and booms out of volcanic blowholes. Some of the energy reflects back toward me in long lumps and lifts the incoming swell higher. I must avoid the huge break known by surfers as King Kong, which I can already see about a mile off. Suddenly, lightning shoots horizontally across the low horizon to my right. My heart skips. I paddle harder, looking more closely for the best way into the mushroom shaped reef off of Nambukalevu. I see a spot where the backs of the breakers look manageable enough for this loaded, aging plastic boat. The clouds wisp down and rain falls as I surf gently but relentlessly over the lip of the reef. King Kong is off to the left, roaring with such menacing intensity that I do not look at it, much like a nervous climber does not look down. Nagigia Island sprouts from the reef, just off of Nambukalevu. The water over the reef looks like a swimming pool, juxtaposed against the grey sky. I land at the beach near the school in Nambukalevu. The wind shifts around in gusts. A lone man descends a winding staircase to my left. The stairs look like something out of a fairytale land. I explain to him that I need to stay for the night and could camp anywhere. He says he needs to move his boat over to the other side of the big cliff to the north, and that I can follow him that way, as there are places I can stay there. A young man helps me move the Looksha up and into the crabgrass. Emma makes an amazing beef stew, and we three talk for a few hours as the windy night pulls over us. I lay down early, and fall asleep to the sound of Steven and Emma giggling together as they weave baskets out of palm, to later sell. 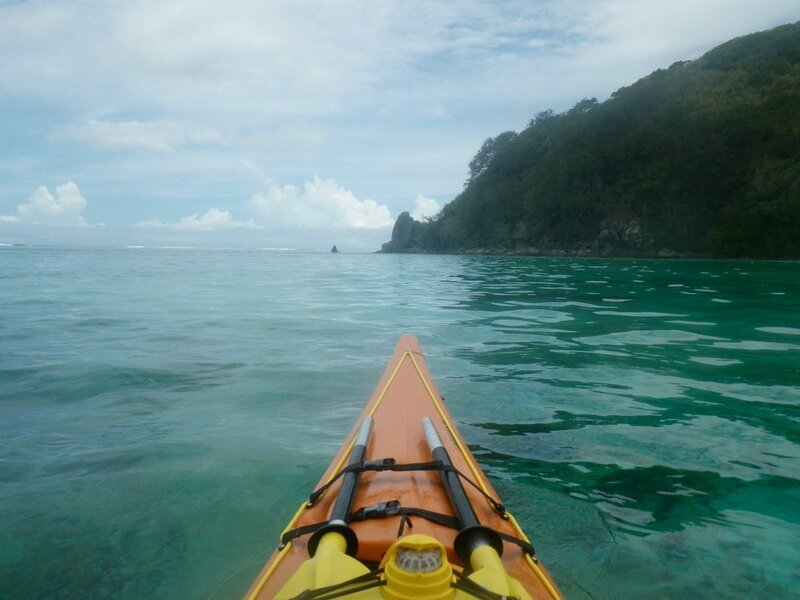 I paddle under the cliffs of western Kadavu. 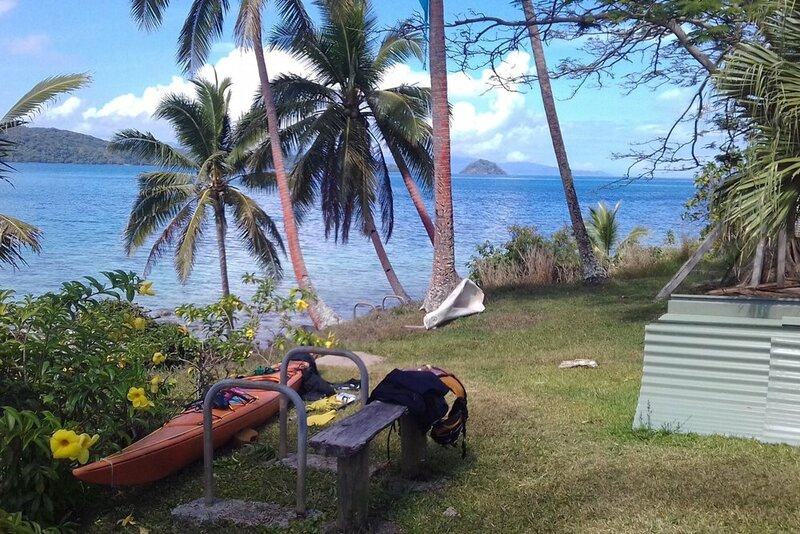 The Nambukalevu reef ends quickly, and I must round the bold coast of Washington Point, and commit to several miles of open water paddling with no bailout points. I posses no information about the coastline ahead, other than it is steep volcanic rock. Because I do not know the coastal features, I stay several hundred meters offshore as to avoid any surprise breakers. Mount Washington, the highest mountain of Kadavu, rises from the southwest corner of the island. Since I first caught a glimpse of it yesterday, its summit has been veiled in a horizontal cloud, which today is a curt little hat. An old metal lighthouse stands atop Washington Point, non functional, a rusted black and white skeleton of colonial rule. Swell runs up against the cliffs below. A wind rises with the sun, and waves build through the thousand foot deep blue water. The waves wash over the Looksha’s stern, and I begin to suspect she takes on water through the hatch cover. A sea turtle surfaces to my right, and then recedes with shock upon seeing my boat, its big shell still clearly visibly hovering below the waves. I feel tremendous vulnerability out here, once again completely exposed to the natural world; the sea, the sun, the creatures, the wind. All I can do is funnel that anxious beat into paddle strokes. It takes hours to push into this wind, Mount Washington always there to my right, always cloud-topped. I see my progress against the mountain and cliffs every now and then, in the way one sees the moon progress between trees; never in the moment but certain over time. A fishing boat passes me suddenly, off the the left, and I choke up with joy at the sight of a person amidst this lonely space. The captain waves, and I frantically return wave. As the land turns north, I see Taululia way off, tiny little colorful houses along the shore. I see the edge of the next reef ahead, awash with breakers. My stress redlines. I had believed that the north side of the island would offer no surfing challenges, as the big swell energy always moved south to north, with slight east-west variations. But here before me is a white mess, indiscernible. I paddle closer, to within a few hundred yards of the lip, and can still see no clear path onto the reef. It is now clear that the immense energy of the South Pacific can turn corners and keep going, which perhaps should have been obvious to me. I divert south toward the nearest cluster of houses, in the hopes of finding villagers to consult about the waves. 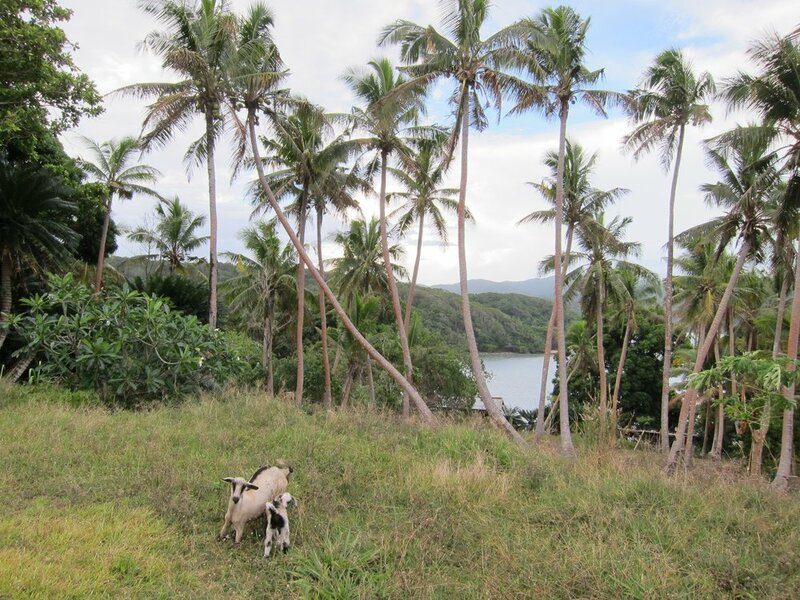 Taululia is the probably the most socially isolated of the places I have experienced in Kadavu. It is stuffed below high mountains, and the English here is poor. I gesticulate more than elsewhere while speaking. Some women walk me to a proper place to pee, just beyond the church. A woman offers me a big cold coconut with a hole cut into the top, and offers me space in the shade. My life, for a moment, is complete. The local fisherman tell me I must wait until higher tide, and then can enter the reef. One of them, a portly, smiley man in a red jersey, offers to drive his boat near me until I am through the break. I agree, and demand that he take money for fuel, but he refuses to accept it. In broken, barely discernible English, he asks about the compass on my boat. I give him my handheld compass. I paddle alongside his fishing boat, and as we near the reef’s edge, I see the line I must squeeze through. As I slide between a sharp volcanic outcropping and a line of menacing breakers, I feel as though I am through. But then, to the left, I see a long wave rearing up, and I divert to the right, and manage to keep away from its curling collapse. 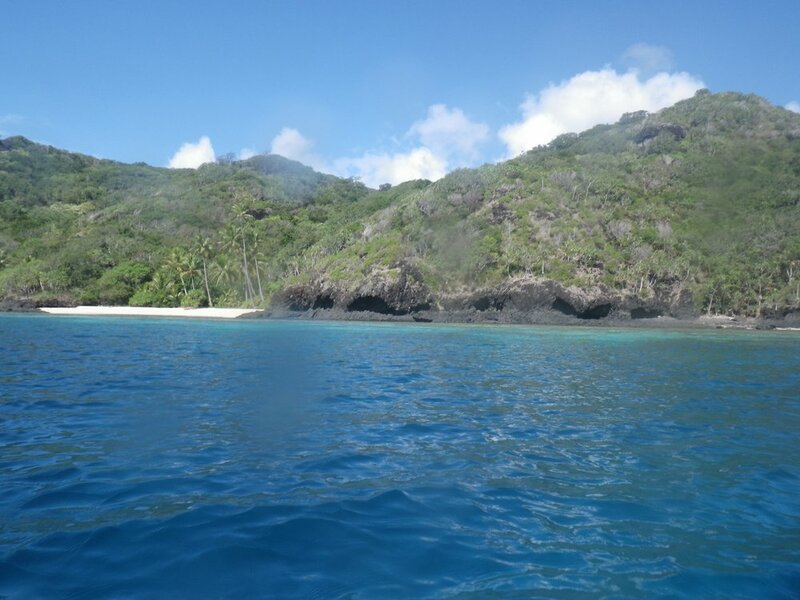 Upon entering this reef, I believe I am now through all of the technical challenges of the Kadavu coastline, and feel immense relief wash through me. Though the hydrological challenges abate, the wind and weather grow upon the horizon. Tall cumulonimbi march, bottoms dark, tops bright white, exploding upward in slow motion. Long sand beaches of Nolatu suddenly shift to volcanic outcroppings, and then back again. Many settlements line the shore, and people fish and swim in groups every half mile or so. 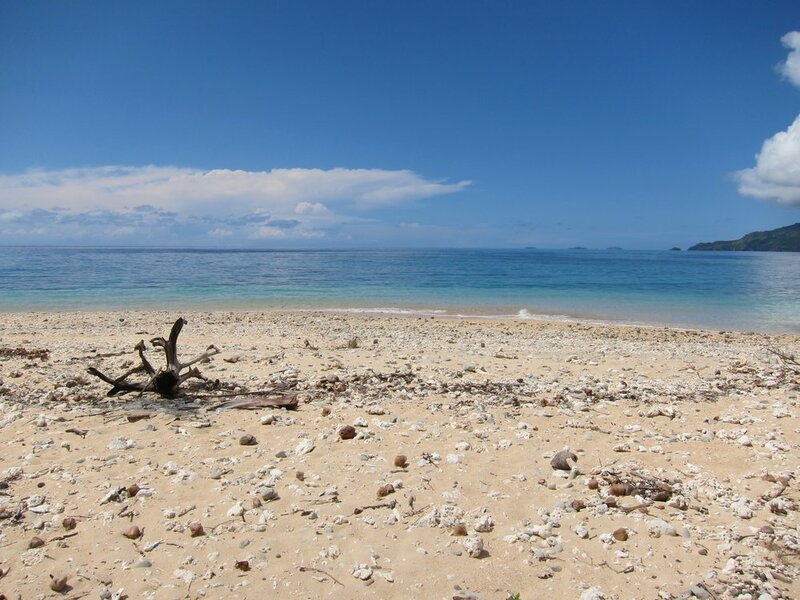 I stop for a break on the last noticeable beach before Tavuki Bay. I open my rear hatch, and it is half flooded. I remove everything slowly, as two women watch from afar, standing waist deep in the sea as they fish. I pump and sponge all of the water out, and then repack. I decide to cut across the opening to Tavuki Bay, but soon begin to think I made a poor decision. The passing isolated thunderstorms have kicked up a mess of waves, and my boat is unhappy and twitchy. I feel like I am paddling in place. The opposing shoreline never seems to get closer. Each passing wave reminds me that the boat sips water into the hatch, and over my belongings astern. With great relief, I finally paddle along the big cliffs between Tavuki and Vunisea, occasionally looking behind in disbelief at what I just came through over the last two days. I see Mount Washington way behind, and feel pangs of an anxiety hangover from my paddle around the west side of the island. But I know now that I will finish the circumnavigation. Vunisea harbor is glass calm, and follow Ratu’s instructions, and scan the shore to find Tevita’s (Aliti’s cousin) house up on the hill. As I land amongst playing children on the beach, I realize that my sunglasses are missing. The last I remember I put them under a front bungee. A wave must have taken them. I cannot continue without sunglasses. I stay one day and two nights in Vunisea in order to wait for the shop with sunglasses to open. I start out at six, long before the sun clears the hills. It is relatively cool, and no wind moves. I paddle quickly, and the shoreline passes, mostly rocky with sand beaches punctuating corners and reliefs. The first sign of activity I see is a few men slowly moving and performing preparatory work near the Dive Kadavu lodge in Drue, as a breakfast fire smolders. Naikorokoro’s beaches and turquoise reef flow by, the air remains still, and the sun finally begins to burn into sight. I feel my armpits chafing under what I have decided is a mandatory long sleeve shirt, and I can feel a wound opening on my right side, where it constantly rubs against the plastic seat back. I try to lean forward as much as possible to lessen the intensity of the rub. Otherwise, I paddle freely and happily, unencumbered by anxiousness. I cross the bay at Daku without worry of being out in the open, and watch several sea turtles peak up from the blue. I can look into the water and sea strange fish milling about, in the branches of coral. Ono Island appears in the distance. 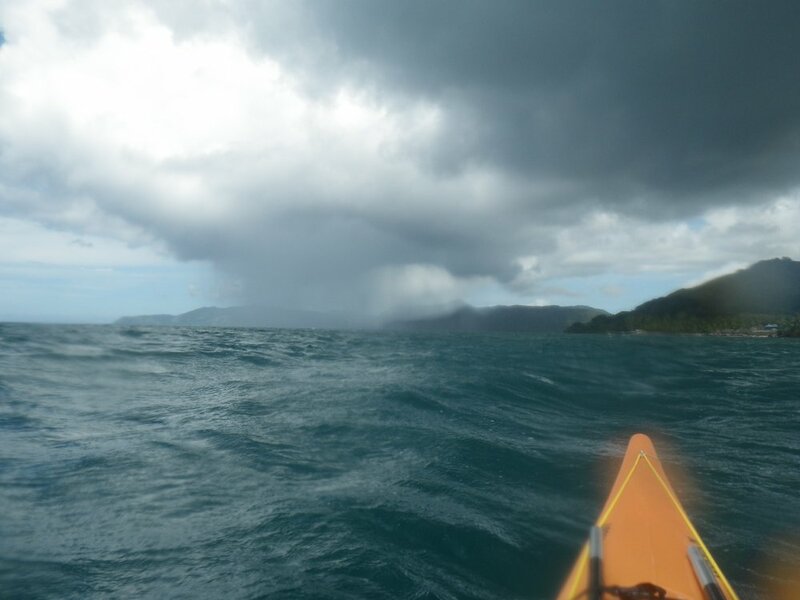 Should the weather stay calm, I would like to paddle up there tomorrow, and then maybe beyond into the other Kadavu Group islands. I look to the left and try to discern Viti Levu, which is 50 miles north, but it must be obscured by the humidity. I pass Rakiraki, and stop at the next settlement for a break. Children come running down the beach toward me. A young man greets me, and invites me to where some other men and women sit in shade and soft grass. I share trail mix with them, and we talk. The man’s dog nuzzles up to me, and we feed him trail mix, much to his delight. I finish the day at Ikaea Beach, a sandy outcropping covered in trees and vines. A lot of sea garbage gathers here, and this reminds me that despite the natural beauty, I travel the developing world, where plastic bottles and styrofoam are sometimes treasure, and thus not always considered trash. I collect some of it and hide it from view in guide-like fashion. Isolated storms roam the sky, and I prioritize setting up my tent and hanging my big green tarp above it. As soon as I am finished, rain falls in wild sheets. I crawl under the tarp and wait out the storm, and then emerge to see a huge rainbow appear over Ono Island. The forecast informs me that east winds will pick up to 30 knots at some point in the next day or two, and remain that high for a week. This news starkly contrasts the dead calm of the morning, and as I finish packing the Looksha, I gaze at Ono Island longingly. I decide to start off, and make the decision about crossing once I reach Tilivia. The paddling feels hard, and I assume this relates to moderate dehydration, and general maladaptation to the tropical climate so far. My diet also leaves something to be desired. Aside from food offered to me, which has steadily waned, on this trip I have only eaten protein bars, trail mix, peanuts, and some instant noodles (in Vunisea). The area of skin on my side rubbing against the seat back is now an opened wound, and I feel at least two infections forming on my hips, presumably where bug bites originally broke the skin. While I near Tilivia, I see the Great Astrolabe again in the distance. From north to south, clear across the horizon, cumulus clouds build. It looks to be the front that must be bringing the high winds. I watch it for ten minutes, and the front appears to cruise in my direction steadily. This, combined with my body’s complaints, tell me I should continue back to Ratu’s rather than crossing to the northern group. With the wind forecast, I know this decision means I will forego any more paddling here, which makes me a bit sad, but also relieved. The crossing toward Natubagunu feels long. A big blue sailboat has anchored here in the bay, a mile from Ratu’s house, and the ensign is American. I flirt with the idea of paddling over and seeing if anyone is aboard to greet, but I then realize I have no desire to talk to Americans right now. As I approach the beach at Ratu’s house, I see him working on his boat. He doesn’t even notice me land at the beach until I call his name. “Ooooh! He exclaims, like a sportscaster watching a soccer goal. 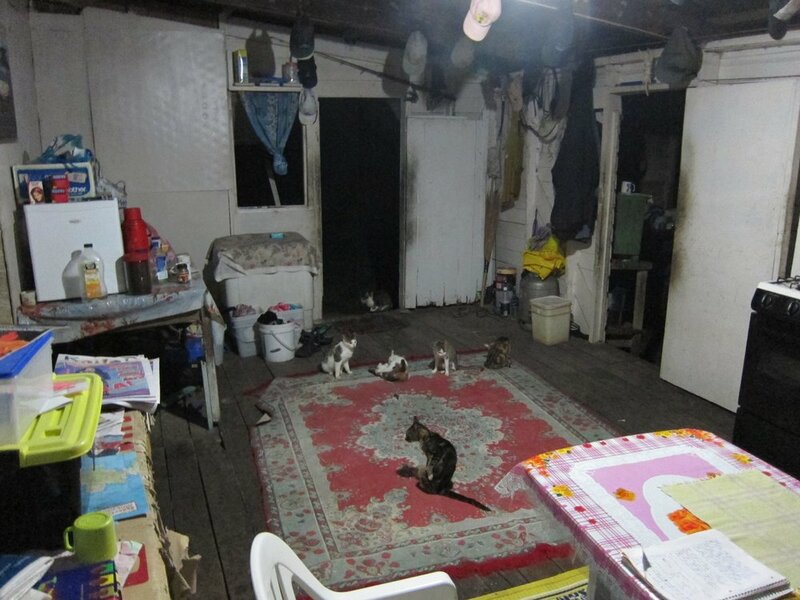 I spend another five nights at Ratu’s house, living a simple life with the family. I read, write, share meals, and walk the beach. I watch the chickens roam the yard, play with the kittens, and talk politics and culture with Aliti and Ratu. I bathe in the volcanic water, listen to the waves roar over the Astrolabe, collect shells for my nieces, and feel deeply at peace.